Wizard Configurator – Welcome! How can we help? The Wizard Configurator is a tool where you can build and configure wizards to manage processes in the WorkPoint 365 solution. Each wizard can be started with a default set of parameters. Dependent on the wizard configuration, the wizard can be launched from either MyTools, WorkPoint Express or from the Modern UI command bar. Several new standard wizards have been added due to additions and changes to the security system of WorkPoint. A Wizard consists of a chain of Wizard Flows. The chain can have one or more Wizard Flows. A Wizard Flow can have one or more Wizard Steps. For each flow there is a predefined set of parameters which the flow supports. In the Wizard Configuration you can provide default values for each of these parameters. Wizards are shown as a small window which takes the user through each step. A case where a wizard could be useful could be if a user wants to create a newentity which largely resembles an already existing one. The user can set up a wizard that has the necessary steps to copy an entity, and then the user can edit the copy to his/her specific needs. That Wizard then takes the user through all necessary steps for copying an entity, and the wizard can be used on any entity, whenever needed. The Wizard Configurator is a licensed feature. If you want this feature for your solution, please contact WorkPoint sales at sales@workpoint.dk. Due to changes to WorkPoint’s security system this new wizard has been added. The master data of entities are now read-only for all users, but this data can still be changes through this wizard. In effect this means that no one can edit meta data for entities apart from through this wizard. Access to this wizard can be set through security rules, which in effect restricts access to meta data change to specific users, specified through security rules. An example could be a wizard named “Copy Documents to Project”. The purpose of the wizard is to select some of documents from a document library on a company site and copy the documents to an underlying project document library, converting them to .pdf files in the process. This wizard consists of two Wizard Flows, “Find / Create entity” and “Copy documents”. The first flow has two steps - "Find Entity" and "Edit / Create Entity" - and the second flow has only step - "Copy Documents" - so this configuration will launch a wizard with a total of 3 steps. Another example of a useful Wizard is the Copy Entity wizard. Often a user has the need to copy an existing entity. A typical case for this is that a new entity is needed which resembles an already existing one. This way, the user skips entering in basic data again. 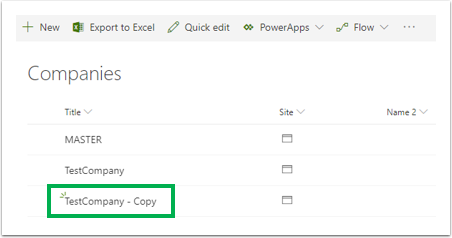 Step 1 from the list above can be skipped, in case the copy-entity action is performed directly on a selected entity in the entity list. Changes the state of the entity. If this flow is the only flow of the wizard, no editing form is shown afterwards. This flow is used for choosing which content from the source that should be copied over when copying an entity. The system can copy lists (content and folders) and relations. This step includes an editing form for the entity. 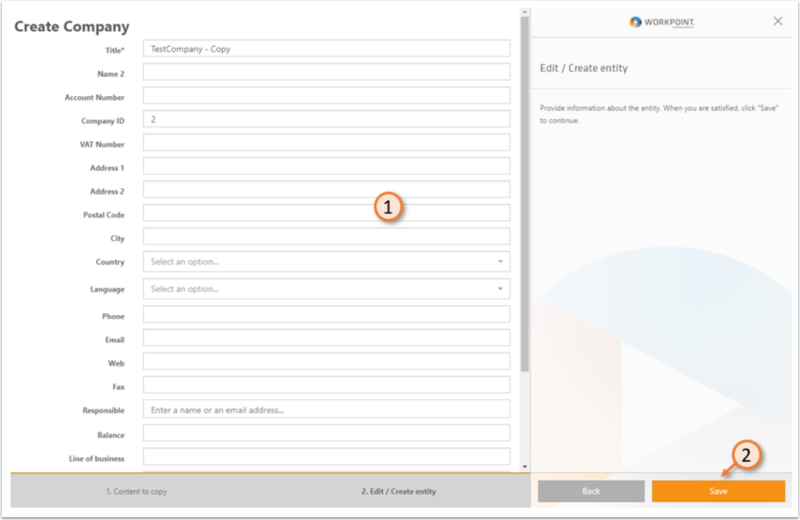 This step includes the searching and option to create a new entity or edit an existing one (this flow has a built-in editing form). For title, the administrator can give the wizard a name. This should be descriptive of the functionality of the wizard. Optionally, the administrator can add one or more translations to the title defined in (1). The Administrator can type in a description of e.g. what the wizard does and/or when to use it. Optionally, the administrator can add one or more translations to the description defined in (3). Select whether this wizard should be enabled. Select whether this wizard should be accessible from the Command Bar in WorkPoint. If chosen, a button which opens the wizard will appear in the command bar when a copyable entity is selected. A wizard can have one or more flows. 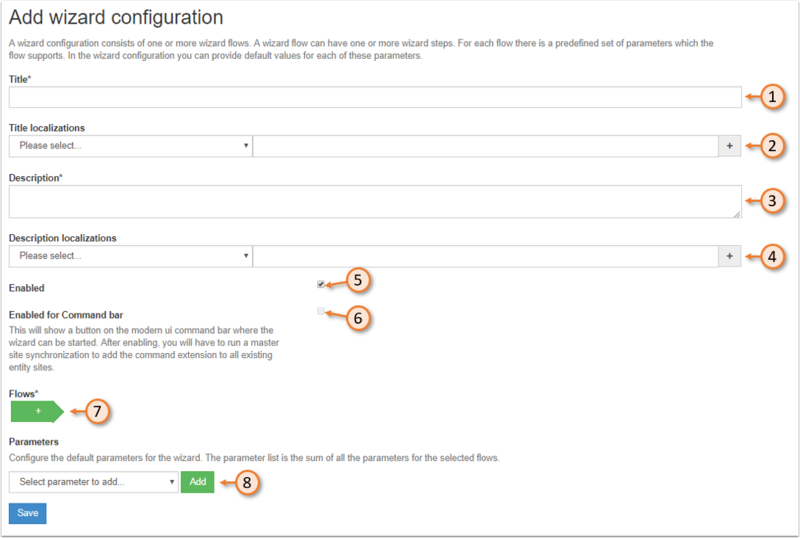 The interface will let the administrator know if no more steps can be added to the chain, as some flows exclude others. In effect this means that certain combinations of flows are eligible, while others are not, and this cannot be set up together. Optionally, the administrator can configure the default parameters of the wizard. The list of available parameters depends greatly on the selected flows. Configuration of the wizard can be finalized by clicking the Save-button at the bottom of the interface. As previously mentioned, wizards can be run from the MyTools panel via a button, or it can be run from the command bar of a library, or both. The current step has its name in bold text, and a gray bar behind it. The user makes relevant choices of the wizard step. The next step can be navigated to by clicking the Select and continue-button. The wizard will move on to step 2 after (3) is performed. 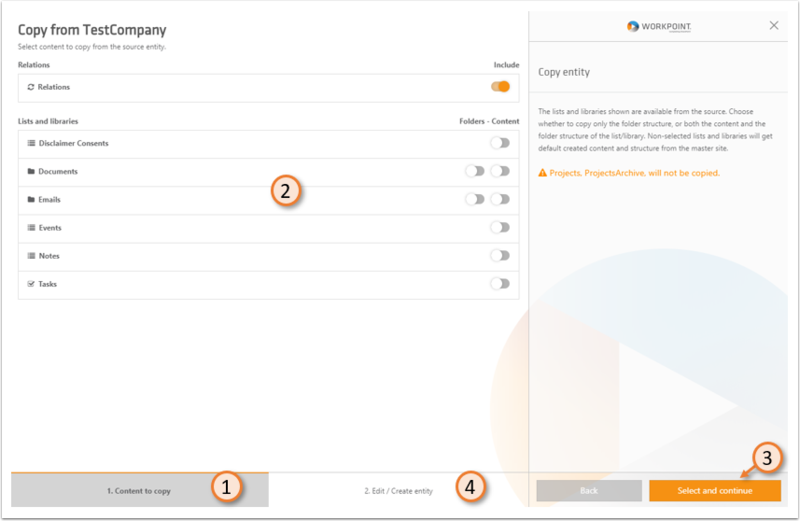 Data is put in to customize the copied entity. The Wizard executes the copy entity function when the user clicks “Save”.